Earthsound’s Darren Regan has written, presented, produced and directed a new 5-part radio show, The Lie of the Land, for Claremorris Community Radio (CCR FM). CCR FM won a Broadcasting Authority of Ireland award, supported by the Sound & Vision III scheme, which funds high quality programmes on Irish culture, heritage and experience. CCR FM approached Earthsound to develop the project which examines the history of Mayo, both geological and archaeological. Darren, who studied Applied Archaeology at IT Sligo has been working as a geophysicist for Earthsound Archaeological Geophysics since 2010 and drew on his extensive experience working on a variety of archaeological sites across Ireland to research and produce The Lie of the Land. Mayo’s geological landscape tells a story of our land’s connection with place and cultures, which today lie oceans apart. The long and turbulent geological history of the West of Ireland, which stretches back hundreds of millions of years, contains tales of colliding continents and the fusing of North America with parts of this island. 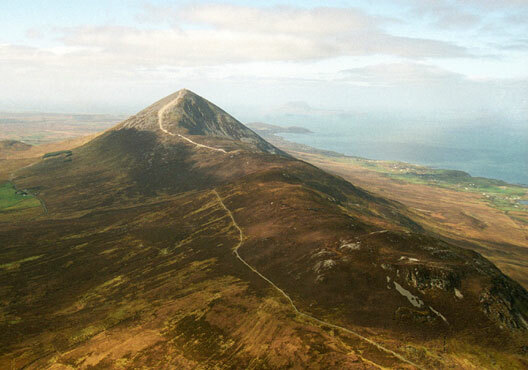 Darren takes listeners on a journey via reports from the prehistoric landscape around Croagh Patrick, to Céide Fields, Ballintubber Abbey, Iron Age cashels in Kilmovee and Bronze Age burial tombs in Irishtown. Claremorris Community Radio’s new five-part series, The Lie of the Land, exposes the history of Mayo, both geological and archaeological. The show features interviews with archaeologists Richard Crumlish, Chris Read and Michael Gibbons, geologist Matthew Parkes, Fr. Frank Fahey, Earthsound directors James Bonsall and Heather Gimson and many more. Produced, written, directed and presented by Darren Regan, this informative and enthralling series will start broadcasting on Saturday August 13th, at 2pm on Claremorris Community Radio. If you miss the show, don’t worry, The Lie of the Land will also be repeated on Fridays at 5pm. © 2013 Earthsound Geophysics Ltd. This entry was posted in Claremorris, Community Archaeology, Geophysical Survey, Press Release. Bookmark the permalink.